Reading this compelling account of the partition of India in 1947, one is moved to ask: What were they thinking? Early accounts of the end of British rule in India concentrate on the high politics of the negotiations between the leaders of the Indian National Congress, the Muslim League, and a succession of Viceroys—ending with the striking and decisive Lord Mountbatten. The British were concerned to leave a legacy, of which they could be proud and hence avoid an unseemly civil war in the wake of their departure. Both the Congress, led by the future Indian Prime Minister, Jawaharlal Nehru, and the Muslim League headed by Muhammad Ali Jinnah, the father of Pakistan, were concerned to inherit a state or states that would be governable and would guarantee civil rights and economic improvement to their people. The negotiations had reached a stalemate by late 1946. Mountbatten arrived in Delhi in early 1947, rapidly decided that partition was the only solution, convinced the leaders to agree to the plan by early June, and then announced, to everyone’s amazement, that the transfer of power would take place in mid-August. This grand narrative, with Mountbatten as the master of ceremonies, has remained dominant for far too long. Questions about Mountbatten’s judgment have emerged in recent years, but the politics of the partition settlement have generally remained at the center of historical focus. In this book, Yasmin Khan endeavors to change that focus by bringing together a range of voices that reveal the human toll of those hasty political decisions. 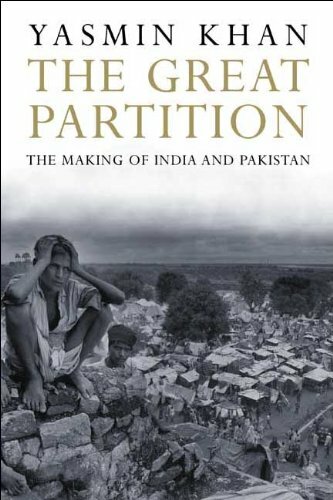 The Great Partition, in other words, listens to “the Indian street,” the stories of ordinary men and women, hapless and displaced by decisions over which they had no control. Hindus, Muslims, and Sikhs fled for their lives to opposite sides of a frontier that was not defined until after Independence Day and its attendant celebrations. Hundreds of thousands lost their lives in the violence. The solidarity of neighborhoods and villages disintegrated. Khan assembles an impressive array of sources from all levels of the social and political spectrum to paint a convincing picture of official incompetence and unseemly haste. The British were more concerned about withdrawal than with maintaining order as they did so. The political leadership, who should have been better prepared for the possibility of violent mass migration, remained remarkably insouciant, convinced that once power was transferred, all would be well. No such luck. This dramatic account brings in much needed ground-level detail and opens up partition’s stories to more varied interpretations. It is accessibly written and I recommend it as a much-needed revision of the official partition histories of decades past.